Quarantine is hard! Feeling stretched thin by everyone’s needs. 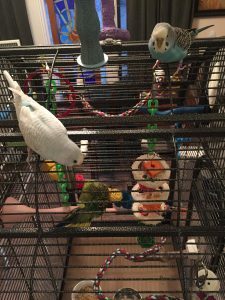 When we were first setting up Kevin’s cage for quarantine I had some very misguided and idyllic notions about how this 30 day span would play out. I pictured Patrick and I hanging out with Kevin tucked away in his room. No care for the outside world, just a magical time for taming and bonding. In reality, quarantine is hard, much harder than I expected. For starters, Kevin has been a pretty tough sell on human interaction. He’s docile and he’ll put up with a lot of handling, but he’s really not into it. And he’s still pretty freaked out, which makes sense after living in a pet store for over a year. We are spending a ton of time with him, but it’s not all that gratifying. I know that part will pass. The other piece of it that I hadn’t anticipated the emotional weight of is that while Patrick and I are in with Kevin teaching him that humans are a good thing; Toby and Kelly are losing a ton of their human time and outside the cage play time. They are not shy about letting me know it’s unacceptable. I was only able to let them out for an hour one day, so they next they were crazy clingy and on me like tiny flying shadows. Not that I’m complaining about that, it’s nice to feel loved! Another thing I hadn’t calculated the time cost of is maintaining three cages in two separate locations. It’s usually pretty easy to clean up after Toby and Kelly, and get their food and water in the mornings. 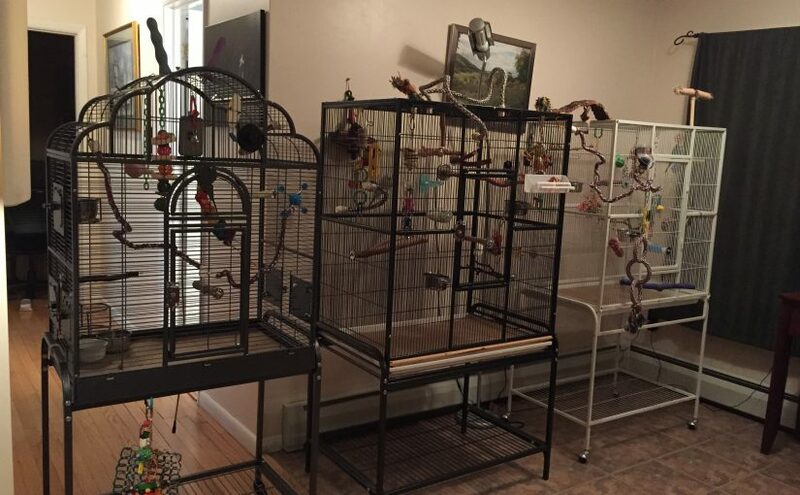 But with a third cage in a different location with no sink in the room….it’s kind of a pain in the rear. I’m sure this is hyperbole, but some days I feel like all I do is take care of budgie needs without really enjoying any of the budgies. I can’t imagine how people manage quarantine when they’ve got a larger flock to tend! After a few days of both Patrick and I trying to be everywhere at once we decided to divide and conquer. Patrick is largely taking care of Kevin’s physical needs and training and I’m taking care of the girls. I’m still getting at least 30 minutes with Kevin every day, but I don’t feel pressure to push him on taming, I can just hang out and feed him Millet, say nice things to him and working on stepping up and other easy things. Patrick, on the other hand, has trimmed Kevin’s nails, given him a bath, and even made him taste some vegetables. He has also spent hours challenging Kevin to move around outside and inside his cage, and helped Kevin learn how to climb on the cage bars. It’s a fairly large bummer for me to miss out on all of this, but I don’t see another way to go about it that’s fair to Toby and Kelly. I thought I was really going to enjoy this quarantine time, but in reality it’s full of unanticipated challenges. 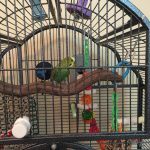 Posted on December 5, 2017 December 3, 2017 Categories Our Parakeet StoryTags new parakeet, parakeet health, quarantine, socializing, training2 Comments on Quarantine is hard! Feeling stretched thin by everyone’s needs. 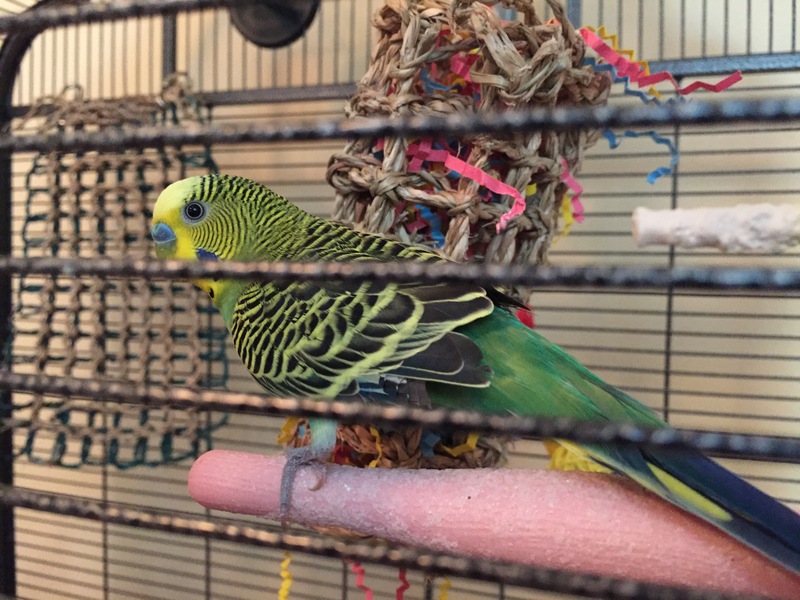 Introducing Kevin – our third parakeet and first boy! We did it! 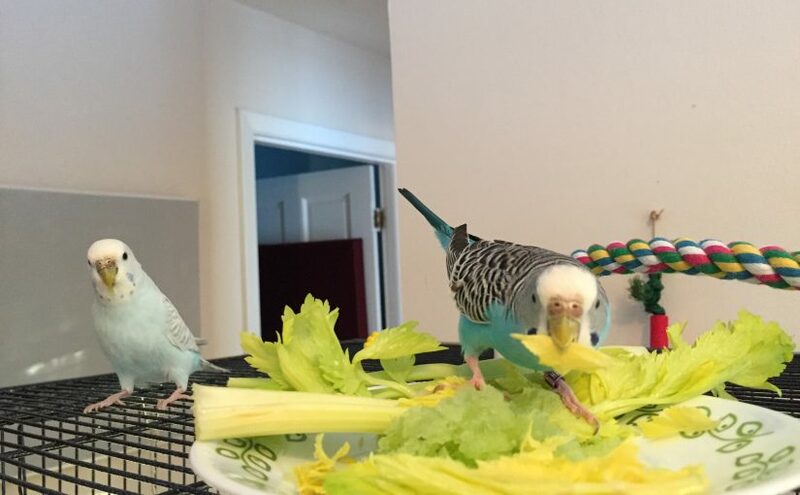 This past Saturday, after much hemming and hawing (Patrick) and excessive preparation (me) we went to Benson’s and picked out our third parakeet and first boy budgie. His name is Kevin to fit in with the rest of our Office-inspired flock names. He’s definitely a mature gentleman. We didn’t ask at the store how long he’d been there, but based on his visible irises and lack of baby bars he is at least one year old. That’s totally a minimum, comparing his eyes to Toby’s I think there’s a good chance he is two plus. I had received a recommendation from a reader to get a mature fellow who would be able to stand his ground against my dominant ladies. 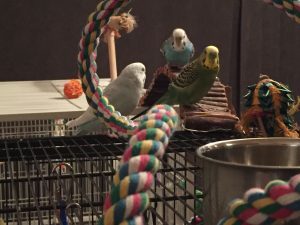 When we arrived at the pet store Saturday morning we found they only had four males available in their entire parakeet aviary. Two of them were under a year old and there was one gent even older than Kevin. We must have watched them all for at least an hour and what we saw of Kevin’s behavior and health looked very good. We were able to watch him eat and drink and forage around on the floor. He would frequently perch by himself, but if he was joined by other parakeets he was happy to chat to them and be part of the group. His eyes are bright and clear and his nares are free of any obstructions or anything that would make me concerned about respiratory infection. His feet look a tiny bit dry but there’s no sign of mites on either his feet or his cere. Although we couldn’t quite hear him we could see that he was singing his heart out, which is something we are sorely missing in our flock of screeching ladies! Before we left the shop they had us sign a form indicating that if we weren’t able to care for Kevin they would take him back at any time. 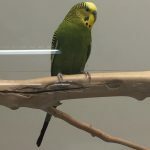 Every employee we spoke to also took care to ask us if we were familiar with caring for parakeets and had everything we needed for Kevin at home. I thought that was a really nice touch and showed me that they care about animals. They also clipped Kevin before we took him home. 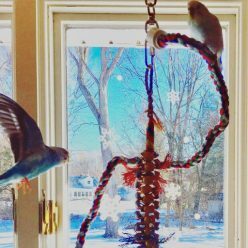 I know, I am an incredibly staunch opponent of clipped parakeets in your home. But, it made me feel more secure transporting him and I feel like it will give us a leg up in taming him during his quarantine. Also – they did a super tasteful job, not as severe or debilitating as Kelly’s clip was. 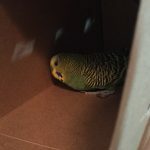 Arriving home we transferred Kevin from his cardboard box to his quarantine cage. 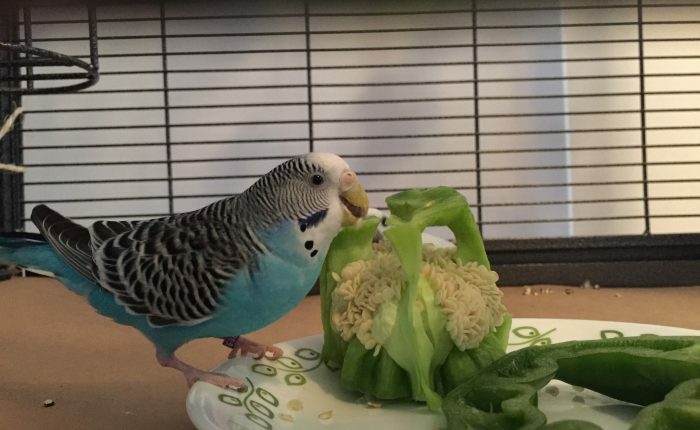 Even though I have written a whole lengthy post about what to expect when you first bring home your parakeet it has still been a horrible couple of days feeling bad for Kevin! He is obviously terrified and didn’t move for many hours after coming home. We weren’t even sure he had eaten until 22 hours in, which was nerve-wracking. Again, even though I KNEW exactly what would happen, it still felt awful seeing him so scared. I put our “Nanny Cam” trained on his cage and I’ve been peeking at him every so often during the work day. It really makes me sad seeing him just sit in one spot for hours, but I know that he will eventually understand that his new cage is a safe space. He can hear Toby and Kelly and they are definitely freaking him out a bit too. They are totally unaware that he’s in the house, since he hasn’t made a peep yet. Occasionally they hear a bell ring and get a bit curious, but until he starts vocalizing they should be blissfully ignorant! One thing about quarantine has been much harder than expected, and that’s the way shutting the quarantine room door has messed up our heat. Now the quarantine room gets stifling warm, and the rest of the house is much chillier. So, we’ve had to resort to leaving the door cracked open a bit when the girls are safely stowed away. I know it totally violates the separate air space tenet of quarantine, but I couldn’t very well freeze Toby and Kelly for 30 days! As it is, Kevin has the K&H Snuggle Up Bird Warmer , Kelly had been acting chilly over the weekend so now she has the K&H Thermo-Perch . Toby appears to be totally fine with the temperature but we’re keeping an eye on her. Bringing home Kevin has been so different already, I hate that he’s tucked away and can’t ease into the rhythm of the household. We’re making a big effort to sit with him, but it’s not the same as his being able to observe us all the time and see that we are not threatening. He seems like he will do okay ultimately. He does show some fear when we put our hands in the cage to change water or food, but he doesn’t flap around like crazy or totally lose his mind. He seems tentatively curious about his surrounds outside the cage. You can see his head swiveling around when he hears noises to try and figure out what the heck is going on. He has been eating regularly since his 22 hour hunger strike and his poops look great. Kevin has not shown any interest in playing with the toys in his cage, but I don’t think he was exposed to toys so we will have to show him how to play down the road. Failing that, I’m sure he’ll pick it up from Toby and Kelly! I don’t want to squander these 30 days and I want to make a big effort towards bonding with him. On the other hand, I’m a total softy and I know that he would feel so much safer and more comfortable if he was interacting with Toby and Kelly. 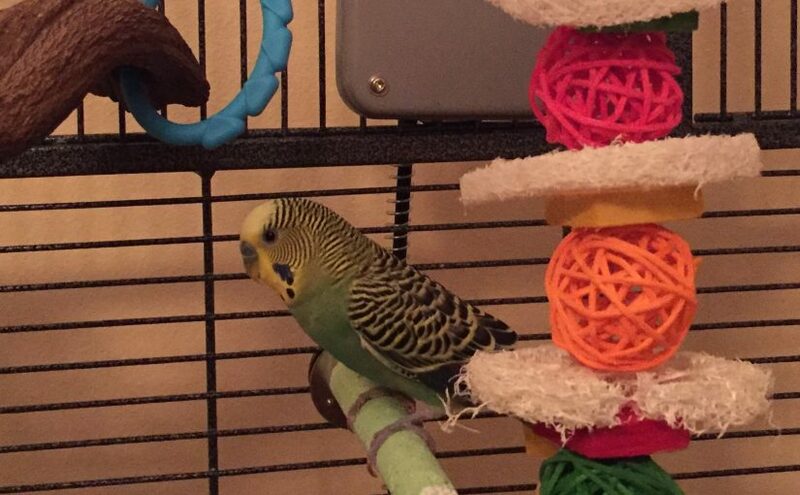 Overall it’s exciting but also so weird, until he starts making some noise it’s very easy to forget the is there at all, it’s almost like we still just have two parakeets. I can’t wait until he’s as noisy and demanding as the rest of my budgies. Seeing the difference between Kevin and Toby/Kelly makes me regret ever saying that the two of them aren’t very tame. They aren’t trained to do much, certainly, but compared to someone straight from the pet store they are entirely tame. 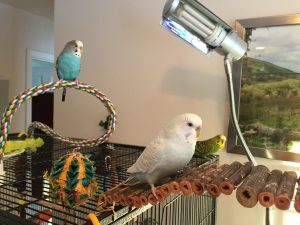 Posted on November 28, 2017 November 27, 2017 Categories Our Parakeet StoryTags basics, new parakeet, quarantine, setup, socializing2 Comments on Introducing Kevin – our third parakeet and first boy!